HOBBY, SIR CHARLES, Massachusetts merchant, knighted July 1705; lieutenant-governor of Annapolis Royal, N.S., June-October 1711; b. in Boston c. 1665; d. in London, 1715. 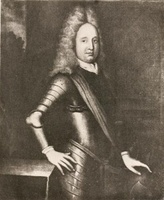 Charles Hobby was the son of William and Ann Hobby of Boston. His father was a merchant of considerable wealth, and Hobby followed his father’s mercantile career. As a young man he went to Jamaica where he lived from at least June 1692 (he was later knighted, ostensibly for bravery during an earthquake in that month) until he returned to Boston early in 1700. There he went into partnership with his brother-in-law John Coleman and was for a time one of the leading merchants in the town. Wealth and connections brought local prestige and Hobby became a selectman for Boston, justice of the peace for Suffolk County, captain of the Ancient and Honourable Artillery Company, colonel of the Boston regiment of the Massachusetts militia, and eventually warden of King’s Chapel. Hobby’s influence was in part the result of his early acquaintance with Governor Joseph Dudley, but beginning in 1703, he and the governor quarrelled frequently over the latter’s awards and penalties to Hobby’s privateering ships. Early in 1705 Hobby took his complaints to London, where he quickly found himself the representative of a number of diverse groups – the Boston merchants, the Puritan divines of Massachusetts, the proprietary supporters in New Hampshire – all wishing to see Dudley removed. For the next two years Hobby worked with these groups and with friends at court to get the governor displaced, using as his main charge the governor’s “conspiracy” with Samuel Vetch, another Boston merchant, to trade with the French in the current war. The charges against Dudley were scheduled to be heard at the Board of Trade in February 1706/7 (o.s. ); then, at the last minute, Hobby decided not to appear. Why? Probably he was impressed with the strength of Dudley’s connections at Whitehall; he had also come under the influence of some of Dudley’s close friends, including Francis Nicholson; most important, Vetch himself may already have suggested the possibility of collaborating in an attack on Canada. In any event Hobby returned to Boston the following year and made his peace with Dudley; within a few months of the reconciliation Hobby volunteered to join Vetch’s expedition against Port-Royal and was chosen to go with his Boston regiment. After many delays the expedition sailed in September 1710, under Nicholson’s command. In October Port-Royal fell to the British and Vetch was made governor of the fort (soon to be renamed Annapolis Royal) and of a three-mile surrounding area. Hobby was second in command. The following June Vetch left for Boston to plan a full-scale attack on Quebec and Hobby was left in charge of Annapolis. The garrison he commanded was by now reduced by disease and desertion, while the fort was beginning to fall into disrepair. Furthermore, they were surrounded by hostile French and Indians organized under Bernard-Anselme d’Abbadie de Saint-Castin, who were daily awaiting supplies in order to attack the fort. Hobby soon received news that Sir Hovenden Walker, commander of the Quebec expedition, was sending 200 New Englanders to reinforce the Annapolis garrison and in return demanded that Hobby return 100 British Marines and all the mortars and ordnance stores he could spare. Hobby called a council of war. Fearful of a French attack the officers at first decided the fort could spare neither men nor supplies and sent Walker word to this effect. Vetch, however, encouraged Walker to repeat his order at the end of July and this time Hobby complied. Meanwhile, the French and Indians had become more aggressive. Early in June, a detachment of about 70 men, sent from Annapolis to harass a nearby Indian settlement and restore the transportation of wood to the fort, was ambushed by Indians about 12 miles north of Annapolis Royal (near modern Bridgetown); some 30 soldiers were killed. Shortly afterwards a force of about 200 French and Indians laid siege unsuccessfully to the fort. Otherwise Hobby’s term of office was uneventful. He repaired the fort and, despite a great shortage of supplies, managed to hold the garrison together for the brief period of his command. After the failure of the Quebec expedition, Vetch returned to Annapolis Royal in October, bringing Thomas Caulfeild to replace Hobby. The latter went back to Boston and resumed his mercantile activity for the next two and a half years. His Boston business was unsuccessful but he retained his interest in Nova Scotia and invested heavily in real estate and building there. When Vetch quarrelled with Nicholson, Hobby went to England in the spring of 1714 with Nicholson’s encouragement to seek the governorship of Nova Scotia for himself. He and Nicholson drew up charges of maladministration against Vetch, which they submitted to the Board of Trade. Soon after Hobby’s arrival in England, however, Queen Anne died and Hobby, ever the opportunist and observing Nicholson’s prospects temporarily dimmed under the new king, once again cultivated the friendship of Vetch. It was hardly coincidence that Hobby’s testimony against Vetch at the Board of Trade (18 Jan. to 4 Feb. 1714/15) was strikingly ineffectual and that Vetch recommended him for the lieutenant-governorship immediately afterward. Hobby was thus in line to be lieutenant-governor again, when he died in London in 1715, leaving a widow and a son. Hobby’s estate was insolvent. In 1706 he had purchased rights to half the proprietary lands in New Hampshire; his Boston creditors and his son John tried unsuccessfully for more than ten years in New Hampshire courts to have his land rights converted to payment of his debts. His insolvency has been attributed to “high living”; more likely it was the result of simple business incompetence combined with the failure of his privateering, his New Hampshire lands, and his command at Annapolis to pay off as he expected. As a politician and military commander he was equally unlucky; in all his activities he was above all a rank opportunist, even by the standards of an age of opportunism. Boston, Registry Dept., Records relating to the early history of Boston, ed. W. H. Whitmore, W. S. Appleton, et al. (39v., Boston, 1876–1909), I: [Boston tax lists, etc., 1674–95] (1876); VII: Boston records, 1660–1701 (1881); IX: Boston births, baptisms, marriages, and deaths, 1630–1699 (1883); XI: Records of Boston selectmen, 1701–1715 (1884). “Correspondance de Vaudreuil,” APQ Rapport, 1946–47, 430–31. Hutchinson, Hist. of Mass-bay (Mayo). Mass. Hist. Soc. Coll., 5th ser., VI (1879); 6th ser., V (1892). [Cotton Mather], Diary of Cotton Mather (2v., New York, [1957? ]), I, II. New Hampshire provincial papers, Documents and records relating to the province of New Hampshire (40v. in progress, Concord, 1867– ), III, IV. N.S. Archives, II. N.S. Hist. Soc. Coll., IV (1884). Probate records of the province of New Hampshire, ed. A. S. Batchellor et al. (24v. in progress, Concord, 1907– ), I. PRO, B.T. Journal, 1704–1708/9, 1708/9–1714/15; CSP, Col., 1701, 1702, 1702–3, 1704–5, 1706–8, 1708–9, 1710–11, 1711–12, 1712–14, 1714–15. Walker expedition (Graham). ... The book of dignities, ed. Joseph Haydn and rev. Horace Ockerby (3d ed., London, 1894). New Eng. Hist. and Geneal. Register, XXIV (1870), XXIX (1875). James Savage, A genealogical dictionary of the first settlers of New England . . . (4v., Boston, 1860–62; 2d ed., Baltimore, 1965), II. Shipton, Sibley’s Harvard graduates, VI, 246. Society of Colonial Wars, Annual register of officers and members (New York, 1896); Register of officers and members, 1897–98 (New York, 1898); General register, 1899–1902 (New York, 1902). W. H. Whitmore, The Massachusetts civil list . . . 1630–1774 (Albany, 1870). ... Nathaniel Adams, Annals of Portsmouth (Portsmouth, N.H., 1825). Bernard and Lotte Bailyn, Massachusetts shipping 1697–1714 (Cambridge, Mass., 1959). Jeremy Belknap, The history of New Hampshire (Philadelphia, 1784); ed. John Farmer (Dover, N.H., 1831). Brebner, New England’s outpost. Calnek, History of Annapolis. Commonwealth history of Massachusetts, ed. A. B. Hart (5v., New York, 1927–30), II. J. A. Doyle, English colonies in America (5v., New York, 1882–1907), III. Everett Kimball, The public life of Joseph Dudley; a study of the colonial policy of the Stuarts in New England, 1660–1715 (New York, 1911). The memorial history of Boston including Suffolk county, Massachusetts, 1630–1880, ed. Justin Winsor (4v., Boston, 1880–81), II. Murdoch, History of Nova-Scotia, I. Kenneth Murdock, Increase Mather, foremost American Puritan (Cambridge, Mass., 1925). O. A. Roberts, History of the military company of the Massachusetts, now called the Ancient and Honorable artillery company of Massachusetts 1637–1888 (4v., Boston, 1895–1901), I. Waller. Samuel Vetch. D. C. Harvey, “History in stone and bronze,” Dalhousie Review (Halifax), XII (1932–33), 69–76..
Alison Olson, “HOBBY, SIR CHARLES,” in Dictionary of Canadian Biography, vol. 2, University of Toronto/Université Laval, 2003–, accessed April 20, 2019, http://www.biographi.ca/en/bio/hobby_charles_2E.html.